Hello CGH readers! 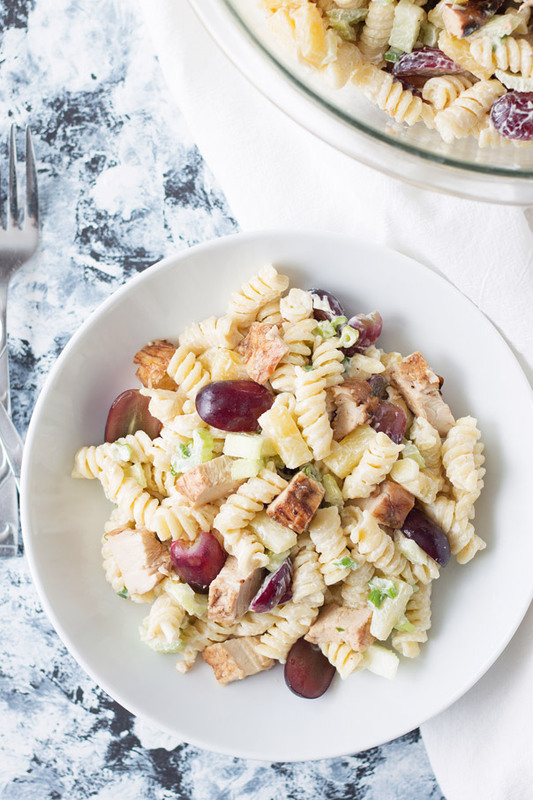 It’s Malinda from Countryside Cravings brining you a Grilled Chicken Pasta Salad that’s perfect for a summer picnic or bbq! You guys, I have a new favorite pasta salad! This will definitely change things up from that plain ol’ pasta salad you usually see at summer gatherings. 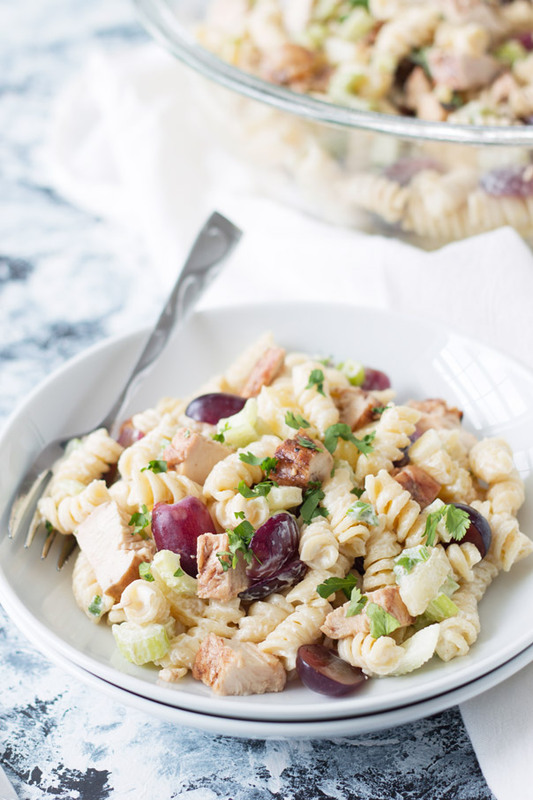 It’s full of flavorful tender chicken (thanks to a marinade), al dente pasta, sweet grapes, crisp celery and pineapple! Yes, pineapple. Before you say “What? !” you really need to try this!! 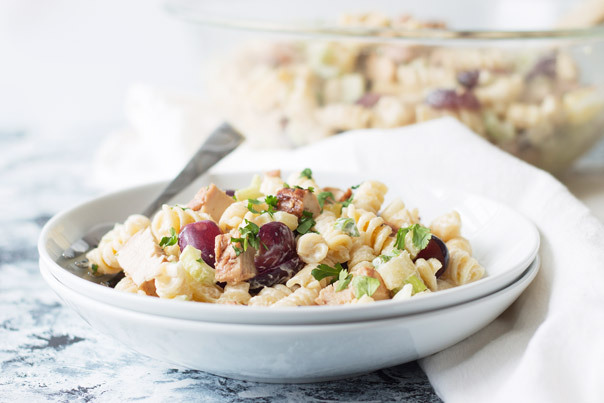 This pasta salad feeds a crowd too! So, if you aren’t taking it to share somewhere it will feed you for days! Bring this to work for lunch instead of going out to eat at lunch and there would definitely be some jealous coworkers!! Feel free to use different pastas. I just like rotini because those spirals hold the dressing a little better. Also, I think this would be great with shrimp instead of chicken! Just cut down on the marinade time if you use shrimp. I think 2-4 hours would be plenty. So, if you’re looking for an easy pasta salad that will would be great for dinner and even better for lunch the next day this is it. Bring it to a bbq this summer and you will get rave reviews! Place chicken breasts, balsamic vinegar, olive oil, garlic, honey, salt and pepper in a large resealable plastic bag. Refrigerate for 4 hours to overnight. Meanwhile cook pasta according to package directions. While the pasta is cooking combine the pineapple, grapes, celery, onions, mayonnaise, sour cream and season salt in a large bowl, set aside. Drain and rinse the pasta with cold water to stop the cooking process. Add to the bowl with the grapes and vegetables and gently stir to combine. Cover and refrigerate until ready to add the chicken. Preheat grill to medium/medium-high heat. Remove chicken from marinade and place on preheated grill. Cover and grill for 15-20 minutes turning half way through cooking time. Chicken is done when the juice of the chicken is no longer pink. Let chicken rest for 5 minutes then slice or dice and toss with pasta salad. Refrigerate any leftovers.